Give for a minimum of three days and preferably do not stop before day 12. Residual activity then lasts for up to 3 -5 more days. Use the longer period of treatment when there is already an outbreak of cryptosporidial scours established. The shorter period of three days is recommended early in the season before signs of scours has started. 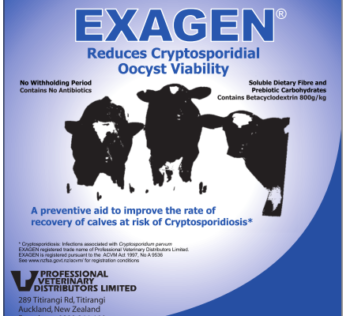 I highly recommend Exagen as a preventative treatment for crypto in young calves. We get crypto every calf rearing season no matter what measures we put in place. This autumn we used Exagen for the first time, Crytpo did still go through the shed but the calves never lost their appetite, all calves got through the challenge well. I put this down to the combination of using Exagen from birth for the first 3 weeks of rearing and the use of adlib Kryptade for 24 hours when the calves scoured. Exagen is very easy to administer in the calves milk, no issue at all. A preventative aid to improve the rate of recovery of calves at risk of cryptosporidiosis. Reduces cryptosporidial oocyst viability, and shortens the period of signs of scours. Contains beta-cyclodextrin 800g/kg, and resistant maltodextrin as soluble dietary fibre and a prebiotic carbohydrate. EXAGEN is recommended as either a preventative or therapeutic aid in the recovery of calves at risk of scours associated with cryptosporidiosis. EXAGEN is recommended for the addition to colostrum, milk, or milk replacers for prevention. 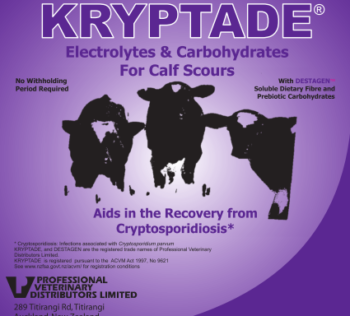 Calves treated with EXAGEN as directed and subsequently developing scours associated with cryptosporidiosis will require a reduced period and a reduced amount of electrolytes for treatment. These electrolytes may be administered as an ad lib supplement over and above fresh water. Calves affected with scours will continue to an appetite for milk. Nursing scouring calves may require lower volumes of milk feed for 1 – 2 days. They will have an earlier return to full milk feeds. Calves will respond to electrolyte treatment faster, being brighter and more alert earlier. An isotonic solution of electrolyte (Kryptade or Enervade) must be used for any breakout scours. EXAGEN may also be added to an isotonic solution (i.e. 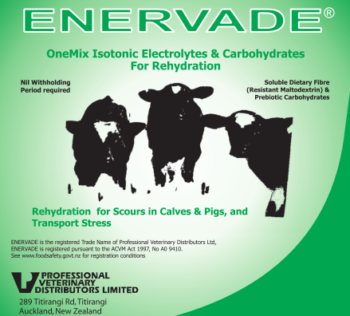 ENERVADE is recommended) to improve the rate of recovery from scouring calves diagnosed as having cryptosporidiosis (scours). Treat all calves entering the calf unit for preventative benefits. EXAGEN mixes readily in colostrum, milk, or calf milk replacers. To mix, add 12.5 g twice daily (25 g once daily gives calves accelerated recovery from scours) of EXAGEN to a meal of colostrum, milk or milk replacers, and NOT vice versa. Make up to the required volume e.g 1 – 3 litres. Dose for at least 3 days, typically past the high risk period to 12 days of age. Allow for EXAGEN to be used for ten days for effective preventative activity. If benefits for maintaining improved recovery from crypto scours are to be extended out to 18 days of age, preventative dosing with EXAGEN will be required for up to 14 days. It is important to start a preventative programme as soon as possible after birth. EXAGEN, ENERVADE and KRYPTADE are the registered trade names of Professional Veterinary Distributors Limited. EXAGEN, ENERVADE and KRYPTADE are registered pursuant to the ACVM Act 1997, A9536, A9410, A9536. A9610 and A9621. 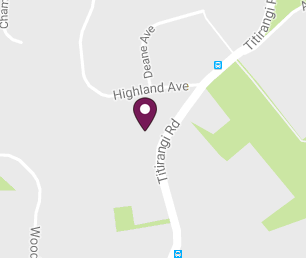 See www.foodsafety.govt.nz for registration conditions.